People from the Kumarattiyapuram village have been protesting against gas leaks and bad effluent management for many years. 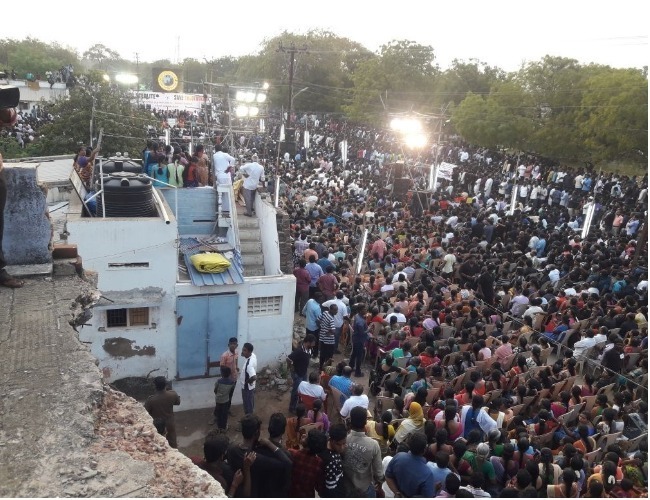 Thousands of people- young and old- gathered near the Chidambaram Nagar bus stand in Thoothukudi district on Saturday. 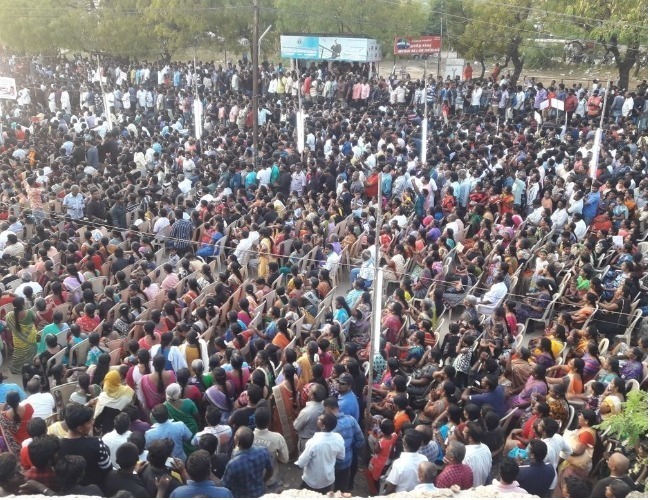 Shouting slogans, cheering speakers on the stage the protesters had two demands: the expansion plans of the Sterlite Copper Plant in the district should be stopped and the plant itself should be shut down. With people from all walks of life extending support to the villagers from Kumarattiyapuram village, the town also witnessed a complete shutdown. People from the village have been protesting against noxious gas leaks and bad effluent management for more than two decades now. However, on Saturday, thousands came together to lend their voice to villagers' fight against the plant that is part of Vedanta Limited. According to media reports, over 12,000 shops were shut for business on the main and arterial roads. Auto rickshaws, minivans in the area did not operate, bringing transportation to a halt. The villagers slammed the government for inaction over the spread of diseases on account of the pollution. The protestors also emphasised on the contaminated groundwater in the area. Speaking to the media, Fathima Babu of the Anti Killer Sterlite People's Movement said, "There are lot of environmental dangers as well as health dangers, particularly cancer. Almost every house is affected by cancer. Children are most affected. Throat cancer has increased. Eye cancer has also gone up. All this is strange and shocking. We have taken the decision that this district can no longer tolerate this. We have entered the field. The trader's association has played a big role today by shutting shop and striking." The full day agitation comes just a month after 250 people in the area went on a hunger strike upon hearing the expansion plans. In 2013, the Sterlite copper plant was fined by the Supreme Court for polluting the land and water in the area on account of a gas leak. The apex court also slammed the plant for operating without requisite permits for a considerable period of time. Speaking to The News Minute, police officials noted the peaceful manner in which the protests were going on, confirming that no protester had been detained. According to environmental activist Nityanand Jayaraman, air pollution is already a matter of worry in Thoothukudi. A copper smelter, he said, would make an already bad situation worse. "Copper smelters are very polluting industries. They lead to the release of sulphur dioxide and dust particles in the air. In addition to this, a plant such as this will require a lot of surface water and resources, which should go for agriculture. Drinking water supply will be depleted," he had earlier told TNM.